Exceptional Mid-Century Modern heavyweight crystal ice bucket. 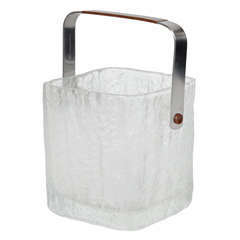 Heavy rounded edges with rock ice glass design along the base and with stainless steel handle. Makes a handsome addition to any barware set and can double as a wine cooler. Large pineapple ice bucket made in Switzerland, circa 1960. Measures: Height 17 cm. Diameter 35 cm. Vintage golf ice bucket by Turnwald decorated in gold 24 carat. In a very good general condition.